Mummys Gold Online Casino Review 2019 - AU$500 Bonus! Free games and bonuses are on offer for all levels with the top level customers offered exclusive promotions, bonuses and prizes. 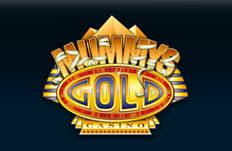 Mummy’s Gold Casino has been around for over 10 years now, making its online debut in early 2003. The casino is owned by the Palace Group who are a reliable well known brand in the gaming industry and it has acquired a good reputation for providing players with original promotions, big bonuses and excellent customer service. licenced and regulated, like many online casinos, by the Lottery and Gaming Authority of Malta, Mummy’s Gold casino is popular with Australian online casino players - perhaps because of its bonuses or its wide range of pokies available. Whatever the reason you’ll always find it packed out with players from Oz. The online casino is powered by the brilliant Microgaming casino software, guaranteeing a great playing experience that is enhanced by top quality graphics and sounds. The bonuses and prizes that can be won are among some of the best that Australian players will find online. The website is well designed and easy to navigate and play, while the encryption used to keep the site safe from phishing and hacking is of the highest quality. On signing up players receive $500. The casino also runs a loyalty points scheme where points are awarded every time you play. It is a four tier system with Platinum being the highest. The more loyal you are and the more you play and spend the higher up the tiers you move. Free games and bonuses are on offer for all levels with the top level customers offered exclusive promotions, bonuses and prizes. The monthly newsletter distributed by Mummy’s Gold Casino - and available to players from Australia - also has special bonuses and offers in each issue. Play at Mummys Gold Casino with your AU$500 Bonus Now! These are just some of over 500+ games you can choose from with more uncommon games like Keno and even scratchcards giving players more opportunities to win. There’s nothing more annoying than having to leave an online casino mid-session because you’ve got to step away from the computer and go and do something boring like commuting to work. But thanks to the Mummy’s Gold app, you can take the casino in your pocket with you wherever you go. However you choose to get in on the mobile action, the most important thing is to stay safe and Mummy’s Gold knows it. That’s why their casino app and mobile site are as secure as the desktop site. Plus, because Mummy’s Gold uses games from online gambling’s most well-known company, Microgaming, the casino has to pass tough tests. If a casino is not secure Microgaming will not allow their games to be featured on the app, desktop site or mobile site. More than 50 games, including pokies. Accepts the same payment methods as the desktop version of the casino. Top quality Microgaming software and games. Deposit, withdraw and play in a range of currencies, including AUD. Frequent mobile exclusive cash bonuses. Your phone or tablet needs to have java enabled. Head to the mobile online casino site. Pick a game and get playing! Download the casino app from the Google Play store. Enter your player details or sign up to the casino. Log in using your details from the desktop site or register if you’re a new player. The casino is protected by the highest levels on security and encryption to ensure your money is kept safe. English is just one of 13 different languages players can play in. German, French Japanese, Russian, Norwegian and Spanish are all catered for along with a handful of others. The casino is well known for its excellent customer service and there is 24/7 support available for Australian players. Online chat is available at the website on a 24 hour basis and staff are well informed and pleasant to deal with. Customer support for players in Australia can also be contacted by phone or email. All in all, having the option to choose from over 400 pokies on one online casino is always great. This is one of the highlights saw in the Mummys Gold Casino review and our team enjoyed seeing some style added to the Microgaming collection. The mummy mascot is ready to unveil its treasure for those who download the app for free and register an account to claim up to AU$500 from the first bonus. While the casino is not thousands of years old, it does have a solid track record since its launch in 2003 and this shows how reliable it is. Players from Australia can download the mobile app for iOS or Android to have the online casino installed on their device. It is also possible to opt for the Flash version from the browser on compatible smartphones. If there are any issues, a toll-free mobile phone number for Australia is listed for getting in touch with customer support. To relax and not worry about security, Mummys Gold has been verified by eCOGRA and has a license from the MGA, one of the highly respected jurisdictions for Australian online casinos. And as a closing thought, the progressive jackpot total here is easily over AU$10 million!